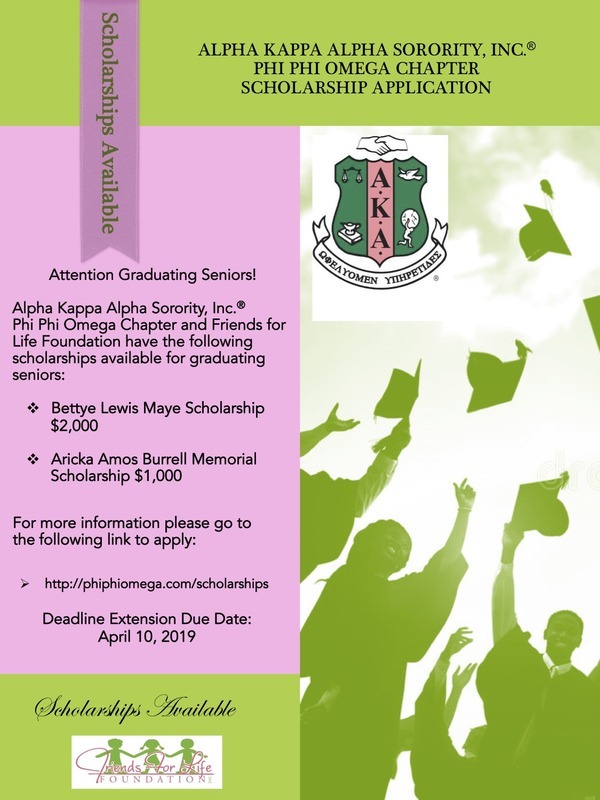 Friends For Life Foundation, Incorporated (FFL) Inc., in conjunction with Phi Phi Omega Chapter of Alpha Kappa Alpha Sorority, Inc, announces the availability of the 2019 Aricka Amos Burrell Memorial Scholarship. Friends For Life is the nonprofit affiliate of Phi Phi Omega Chapter of Alpha Kappa Alpha Sorority, Inc. and was established in 2004. The vision of the Foundation is to promote education, family, economic empowerment and the arts by serving the youth and disadvantaged in the North Fulton Community. Over the past decade, FFL has provided in excess of $400,000 in scholarships and community assistance awards. Aricka Amos Burrell was the niece of Friends For Life and Phi Phi Omega Chapter member, Mrs. Kathy Amos Lamar. Mrs. Lamar serves as a mentor for youth in the Atlanta Metropolitan area, as well as in her church. She affectionately established the Aricka Amos Burrell Scholarship in memory of her niece who died of cancer in 2009. Aricka was a role model in her community and loved working with young people. This scholarship is given annually by Friends For Life Foundation, Inc. The deadline has been extended to April 10, 2019. Those interested in applying for this scholarships must meet the April 10 deadline for submittal to Friends For Life Foundation.